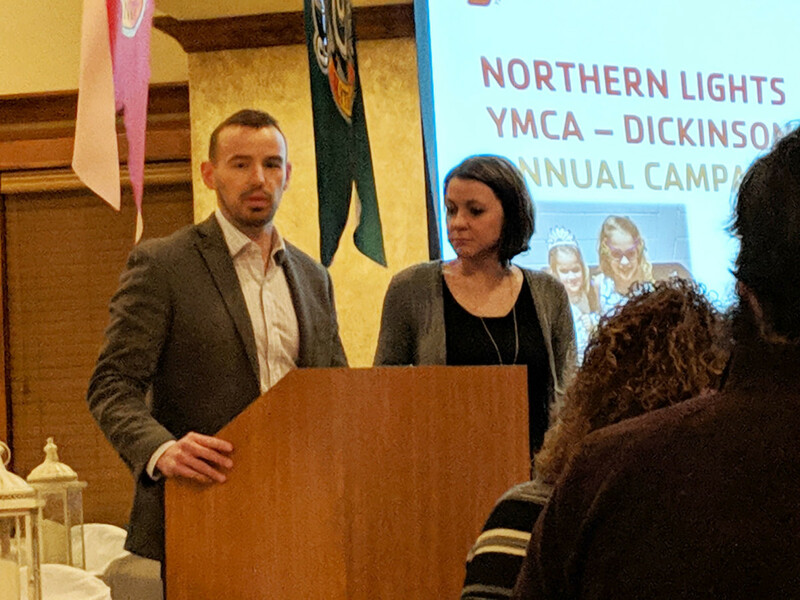 2019 Annual Campaign Co-Chairs Matt and Meredith Pipp speak at the kickoff event held at Pine Grove Country Club. IRON MOUNTAIN – The Northern Lights YMCA Dickinson Center has launched its annual campaign to ensure that everyone in the Dickinson County region has access to vital community programs and resources that support youth development, healthy living and social responsibility. Every day, the Northern Lights YMCA Dickinson Center works to support the people and neighborhoods that need it most by addressing community issues, youth swim lessons, senior exercise classes, homelessness initiatives and personal wellness goals. This year, the Northern Lights YMCA Dickinson Center hopes to raise $50,000. Funds raised will support youth swim lessons, summer day camp, senior health classes, scholarship opportunities and program support. The recently completed Capital Campaign differs from the Y’s Annual Campaign. The Capital Campaign funds are being used for building renovations, which began in December. Annual Campaign funds directly support programming and membership, ensuring access to the Y for all in the community. Last year, charitable gifts from YMCA donors made it possible for: 137 children to have a safe place to learn and build confidence after school; for 231 seniors the opportunity for mobility strengthening and diabetes prevention; and 450 people access to education and training to reach their full potential. To learn more about how you can support the Y’s cause, please contact Jonathan Ringel, NLYMCA Dickinson Center Director at 906-774-4076 or jringel@nlymca.com or click here.